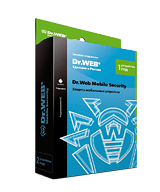 Scans any traffic transmitted on all ports via Dr.Web-supported protocols, including secure connections (if the user has enabled the option to scan SSL traffic). 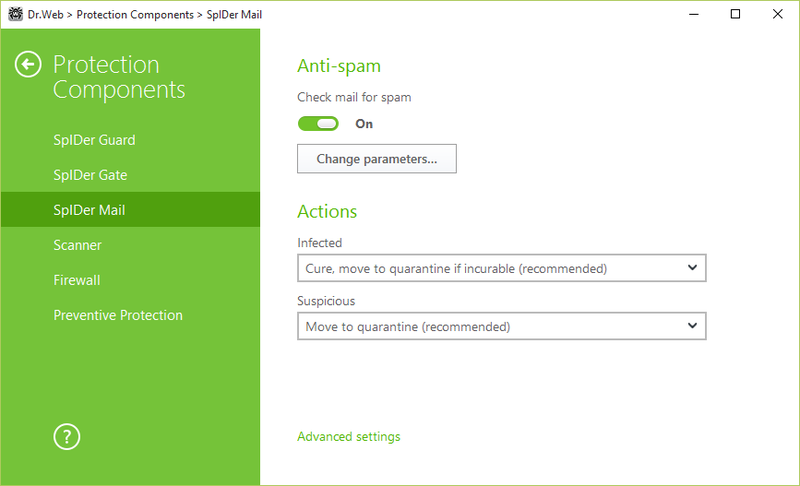 SpIDer Mail monitor scans mail before emails are received by a mail client and prevents malware that is mainly distributed by spam from exploiting software vulnerabilities. Real-time anti-virus and anti-spam scanning of emails over the SMTP/POP3/NNTP/IMAP4 protocols. Scans encrypted SSL connections (SMTPS/POP3S/IMAP4S). Scanning does not interrupt the operation of mail clients and does not cause delivery delays. Analyses the contents and send time of messages, which allows the characteristics of malicious activities to be detected and prevents mail worms from sending out mass mailings. Anti-botnet – you won’t be disconnected from the Internet for sending out spam. The standalone anti-spam analyser module doesn’t require connection to an external server or access to a database, which results in significantly less traffic. It's common for users to follow links in email messages sent by unknown persons and end up with encryption ransomware infections. Thanks to Dr.Web Anti-spam, you’ll never see those messages.